The purpose of this Fund is to support the design and construct of the Wisconsin Hoofers Marina (to include the replacement of all current and any future piers, decks and docks); land space improvements adjacent to the marina; equipment and infrastructure necessary for the operation of the marina; and any other capital improvements associated with the successful construction and on-going maintenance of the marina. The Tong Family Marina will celebrate its grand opening this summer, 2019! Over the past 4 years, the Sailing Team, sailing advisors, Wisconsin Union leadership and Smith Group Architects worked together to create what will be a stunning 21st century Marina for the Wisconsin Sailing Team and all Hoofer Clubs who have actively utilized the Hoofer pier structures over the decades. This project is being completely supported by the Wisconsin Union and gifts from donors across the country, including the Peter and Janet Tong Family. Construction started this fall and has been quite an undertaking, beginning with rebuilding the entire seawall along the Marina. At a total cost of $4.9 million, we have secured about 75% of this goal and there are still named recognition opportunities available. John G. Bollinger, founding member of the Hoofer Sailing Team in 1954, and former faculty and Dean of the College of Engineering at UW Madison (1960 - 2000), made a $25,000 gift and launched a consortium gift challenge to honor the legacy of the Wisconsin Sailing Team program with recognition on the new sloop dock. This recognition is valued at $200,000. John is confident the sailing team alumni family can come together to reach this consortium gift goal, honor the sailing program that had a significant impact in our lives – and also support this transformational project. Please donate what you can to support this consortium gift honoring the legacy of the Wisconsin Sailing Team, and share this with others whom you think may also want to support this project. 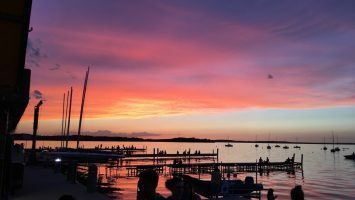 And please – join us this summer on beautiful Lake Mendota and enjoy the beautiful new Tong Family Marina! The purpose of the Hoofer Sailing Club Fund is to support the club in general as administered by the Sailing Club Board of Captains. Support your favorite Wisco Sailing Team Sailors through a charitable donation to help fund the team's operation. Your gift will help cover travel expenses, as well as spring break training in Florida and other locations not trapped in ice.